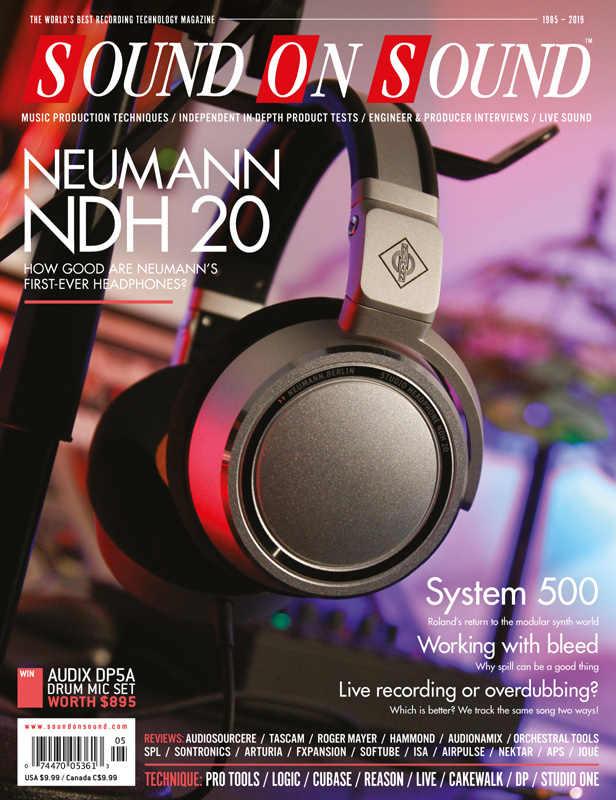 Reviews: Neumann NDH 20 headphones (cover) • Audient Sono • Roland System 500 • Hammond SKX • Arturia Pigments • Sontronics Sigma 2 & Delta 2 • APS Germano Aeon 2 • Joué Board & Modules • FXpansion Cypher2 • Soma Lyra8-FX • Roger Mayer RM58 • Softube Weiss DS1 • SPL Crescendo... and more. Techniques + People: Inside Track: Lewis Capaldi 'Someone You Loved' • Ryan Elder: Scoring Rick & Morty • Working With Mic Bleed • Mix Rescue • Session Notes... plus DAW workshops. The Airpulse brand may be new to you but they're a company with some serious pedigree, as these unusual monitors prove. Audient have used their considerable expertise to create an audio interface just for guitarists. Is the SKX the lightweight gigging Hammond you've always dreamed of? If your thunderous cinematic percussion is getting out of control, you need Taiko Creator. This ambitious overdrive promises to recreate the entire signal path of a valve amp in solid-state electronics. Re-live the sound of the '70s with this classy combination of limiter and tape emulator. Find out how to get the most out of Cakewalk's ripple edit modes. We show you how to integrate your modular soft synths with Ableton Live DAW. Production crew TMS LDN built their career the hard way — and wrote Lewis Capaldi's smash hit 'Someone You Loved' in an afternoon. Impact XT isn't only a drum sampler: used with loops, it makes a powerful live performance tool. Here's how to create glassy, ambient 'shimmer' reverbs in Logic Pro X. Listing of all SOS May 2019 issue's articles which feature accompanying media files. Pro Tools' MIDI implementation still has a bad reputation, but the reality is now very different. In mixing a live recording of a jazz concert, our engineer had to overcome some unusual spill-related challenges. We show you how to keep Reason in sync with the outside world. Our engineer has the rare chance to compare an overdubbing approach with a band-in-the-room recording — and the winner is clear! Cubase Pro 10's VariAudio 3 competes with the best pitch-correction plug-ins around. Find out how by reading our article and watching the videos. Digital Performer has all the tools you need to sculpt the perfect vocal sound. I've been struggling with recording and mixing 'epic' guitar sounds. I'm after something that balances aggression with tone, but which doesn't sound too distorted... Any tips? Read more about Q. How do I make guitars sound more 'epic'? How should I pan my drum recordings in the mix? For instance, should the hi-hat be on the left or on the right? Read more about Q. How should drums be panned? Media content for the May 2019 issue.